The Arab world is suffering from a lack of secular inspiration. There are plenty of leaders who find their political language in religion, but no secular leader or thinker is inspiring the crowds all over the Middle East as happened a generation ago. 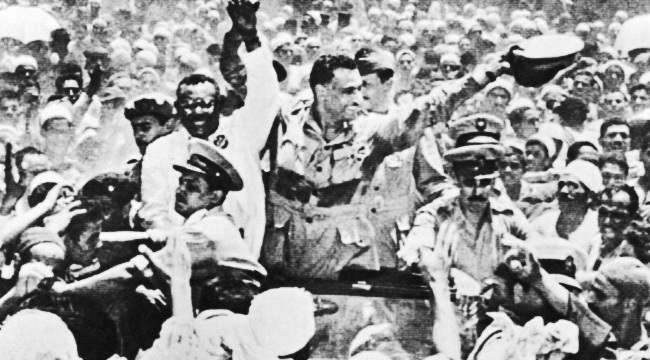 The revolutions of the Arab Spring of 2011 happened without the equivalent of Jamal Abdul Nasser, who had set Egypt and the whole Arab world alight in the 1950s and ‘60s with his stirring new ideas of anti-colonial success and Arab socialism. At that time, a whole generation of Arabs took pride in their pan-Arab consciousness and new-found ability to take control of their own affairs. However, Arab socialism slowly ran out of steam as the young army officers in countries like Egypt, Syria, Iraq and Libya took control of power and failed to re-invent themselves. Their military training and stirring rhetoric did not allow them to innovate politically, so they became the next generation of dictators and their ideas stopped inspiring people. This gap was spotted by the emerging Islamist parties of the 1980s, who did well in countering the sclerotic ex-military regimes’ failures and then built the political Islamist presence that the Arab world is now living with as a dominant reality. But this modern-day success of the political Islamist parties does not negate the heroic legacy of the early Arab thinkers of the Arab Awakening (Al Nahda) of the late 1800s and 1900s as liberals fought hard against Victorian colonial powers and their own authoritarian regimes, seeking representational and inclusive parliamentary government, transparent constitutionalism, women’s education and in some cases bluntly seeking secularism. However, the most influential thinkers of the Awakening used Islamic thinking as the root of their activism. Jamal Al Deen Al Afghani was a fervent anti-British activist, who believed that Islam and its revealed law were compatible with rationality. When in Egypt, he worked with Mohammad Abdu with whom he launched an influential newspaper. Abdu was a notable religious scholar and judge in Egypt, who supported the Ahmad Orabi Revolution of 1879 and played an important part in using Islamic thinking to shape modern political thought in the Arab world. But the self-confident modernism that became to be the defining creed of the Arab Awakening had been exemplified by Rifaa Al Tahtawi, who spent time in Paris and argued that Egypt and the Muslim world had much to learn from the European experience. This legacy had a huge social and political impact during the first half of the 1900s, as was summarised in the Palestinian author George Antonios’ definitive book, The Arab Awakening, written in 1938. And yet, this powerful strand of Arab political thinking was eclipsed by the military coups and subsequent army rule for most of the second half of the 1900s. A few modern examples of this liberal Muslim tradition stand out, such as the two feminist intellectuals — Parvin Paidar, Iranian scholar and activist, and Mai Goussoub, Lebanese artist and publisher — who, the eminent Arab analyst and scholar, Fred Halliday, described as refusing to accept the silence and subjugation demanded of them by both nationalist and religious leaders as well as authoritarian parties from the left. Their confident engagement in the politics of 1970s and ‘80s, along with political feminist giants like the Egyptian Nawal Al Saadawi, helped set the scene for the today’s generation of women seeking their place in public society. Part of the larger problem facing secularists was that many left-wing parties entered into a tactically foolish and morally repugnant alliance with Islamists, and lost their credibility, as described by Stephen Howe in his powerful introduction to Halliday’s collection of essays in a book called Political Journeys. Howe sees this disastrous alliance as part of a widespread tendency of politicians to seek immediate political advantage by disowning the principles of solidarity, denigrating universal human rights, attacking the international institutions and conventions that tried to implement it and disparaging the value of rationalism and Enlightenment which are its necessary foundation. So today, there is a vacuum. The dominant voices of Tahrir Square in January 2011 have vanished. Social media activists like Wael Goneim were all over the media for those vital few months and became household names as they helped change their nation forever. But they did not have an all-embracing political creed that they could adopt for their liberal and secular (although not irreligious) thinking. Today, a liberal Arab will not easily find political inspiration. He or she may read columnists like Talal Salman, the editor-in-chief of the left-wing Lebanese newspaper Al Safir; or veteran commentator Mohammad Hasanein Heikal in Al Ahram. However, things can change. A few years ago, he or she might have looked for articles by Burhan Galioun, then a political science professor in Paris, writing about the importance of democracy for the Arab world. But later Galioun was the leader of the Syrian opposition and despite stepping down a year ago, he may well yet have a place in a new government. There is still room for liberals in the new Arab states and a lot more if they speak out better and organise more, as their ancestors did. Francis Matthew is the Editor at Large of Gulf News, where he was also editor from 1995 to 2005. He has been a reporter and commentator in the Gulf since the 1980's.